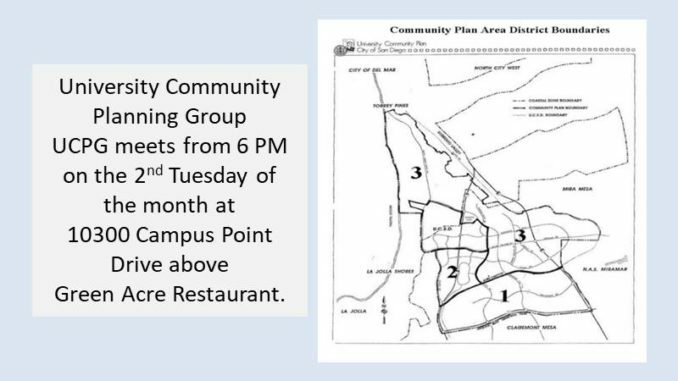 University Community Planning Group (UCPG) will meet on Tuesday, July 10 at 6 PM at Green Acre Campus Point, 10300 Campus Pointe Drive, 2nd Floor, San Diego, CA 92121. Large parking lot, no charge. All are welcome. Agenda items include a presentation by State Senator Toni Atkins who will speak and answer questions on issues important to the community. Elementary Joint Use Park; and updates on SANDAG / Mid-Coast Trolley construction.